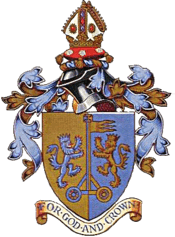 Wednesday night saw Town at home in an Emerson Marketing North Riding Senior County Cup Quarter Final tie against Thornaby FC. The teams had met in the league about 2 weeks ago which Thornaby won 2-1. Subs: David Campion Joe Hillerby and Aaron Foley. It was a bitterly cold night but dry and the pitch looked in good condition although it was damp in places. Town would wear their registered colours of black and white vertical stripes whereas Thornaby would were a blue and white strip. The cold weather had an affect on the crowd which looked to well down on usual numbers. Dan Jones skippered the team and chose to play right to left in the first half. Tom Dawson resplendent in a bright red strip got and early feel of the ball as Thornaby launched a kick into the Town box. Town were very quiet and when Colin Anderson came back to pick up a ball, he laid it back to Shaun Hudson who played a nice ball up the line and then Dan Jones intercepted a ball played across the box and played a ball to Richie Walker who slipped inside and ran out of room. Shaun Hudson was played in by Karl Hewitt but he was marginally offside. Stephen Jackson and Karl Hewitt both put in crunching tackles. Shaun Hudson brought the supporters to life when he dribbled at speed infield before being crudely upended. Nicky Martin tried a shot from distance which was charged down. Dale Elgie played a ball to Colin Anderson who tried a shot from wide right which whistled just past the post. With Dan Jones prompting attacks Nicky Martin was crudely brought down. Persistent play by Richie Walker played in NICKY MARTIN in the 21st minute who shot viciously past the keeper to give Town the lead. Moments later sustained pressure involving Colin Anderson and Dale Elgie gave Stephen Jackson a shooting chance which he blasted into the keeper who could only parry the ball. Neat play on the right involved Nicky Martin and Colin Anderson fashioned a chance for Shaun Hudson but a cruel bounce ruined the opportunity. Jack Proctor and Dan Jones were coping with the Thornaby attacks and Dale Elgie sitting deep was picking up loose balls. Dan Jones took a knock when he got his head to a high ball. Shaun Hudson scampered away up the left but his final ball was not quality. Richie Walker was cautioned and then Tom Dawson saved well low down. Stephen Jackson calmly headed back to the keeper. Andrew Shepherd took a bad knock and the Thornaby player was cautioned. Town had scored a good goal but Thornaby were not yet dead and buried and were still in the game. Competent defending had kept them at bay. No change to personnel were made as the teams changed ends. Nicky Martin tried a shot on the turn and then Colin Anderson couldn't just reach the rebound from the keeper. Richie Walker took the ball off a defender and played a ball to Nicky Martin who centred for Colin Anderson to power in a header but he put just wide. Shots from distance by Thornaby were being caught easily by Tom Dawson. Play down the right involved Richie Walker and Nicky Martin saw Colin Anderson presented with a shooting chance but he spooned his effort. Liam Jarvie replaced Richie Walker. Andrew Shepherd was pole axed in midfield as Thornaby frustration turned to physical play. Karl Hewitt took a ball off an attacker and prompted an attack by Colin Anderson who tried to find Nicky Martin with a first time ball. The idea was spot on but the execution left a lot to be desired. Kallum Hannah fired in s shot which Tom Dawson saved well. Dan Jones won a header and then was pushed to the ground and kicked but the referee took no action. Josh Keogh and Aaron Ransbottom replaced Nicky Martin and Colin Anderson. Josh Keogh played a ball to Shaun Hudson who kicked it out of play. Tom Dawson was fouled by Kallum Hannah who had been cautioned. Stephen Jackson brought the ball out of defence and found Aaron Ramsbottom who was plying a single furrow up top. Thornaby had the ball in the goal but the scorer was offside given by the officials without the aid of VAR ! In the 89th minute Thornaby scored an equalising goal when MICHAEL JAMES found himself in space and scored with a shot across the goal and face of Tom Dawson. With the scores level the game would go straight to penalties.